One of the most simple and rewarding pleasures of gardening, in my mind, is cutting a selection of whatever is growing in the garden, arranging the stems just so and placing the jar, vase or pitcher wherever your nose and eyes can benefit from its beauty. Having a bit of an artist's eye, a green thumb plus a mother who taught me a thing or two about floral design, this simple act makes me fiercely happy as I am able to combine all of these loves and gifts just by arranging a few stems. As usual, I'm drawn to color and texture, so the plant doesn't necessarily have to be in bloom. Hosta leaves are one of my favorite accents, for instance. 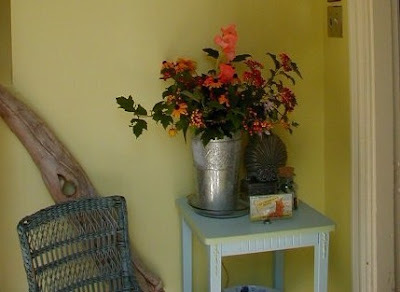 They add a bit of drama and color and form to a mostly haphazard arrangement. Ribbon grass does the same thing, by adding height and a zip of color and sharpness among the round and frilly. The fuzzy lobes of mint add softness, filling in gaps and adds vibrancy with its fresh, cool scent. Ahhh, smell that? Yes, scent is very desirable in my arrangements. Many herbs go into my vases, like the mint. Many of the herbs, if in bloom, add to the color, but fragrance adds a whole other layer of texture and enjoyment. Anise hyssop, with its bottle brush flowers, leggy stems and spade-shape leaves, green with a purple tint around its sawtooth edges is another favorite. Though I don't much care to eat licorice, the scent of the anise hyssop next to mint and other flowers is mild and refreshing. The Russian sage on the other hand, though brilliant colbalt, I use sparingly as its flowers are pungent and the same is true for catmint. Pretty to look at, not so much to smell. Unless you have the nose of our cats, then you may have a different opinion. We have lots of tansy and it's pin cushion yellow flowers are beautiful, but it can also be pungent, so be sure to mix it with plenty of other flowers and herbs. Another flowering medicinal herb that I adore is bee balm. We grow both scarlet and pink and both smell wonderful. Its bergamot scent smells just like a warm cup of Earl Gray. Combined with Greek or Italian oregano stems, the fragrance is intoxicating. As do the fragrances, the colors change as the season progresses. In late spring and early summer, the colors are still soft, pastel with sweet pinks and whites and soft greens and yellows. By midsummer, the colors are becoming bold, with fuschia, orangey yellows, colbalt and royal purple in the mix. Late summer and early fall arrive along with the sunset gold, burgandy and russet and reds of the first berries and rose hips. Throughout the spring and summer, bringing in a bit of the garden to sit on our mantle in the old chippy vase or bit of pottery allows heady scents and and lush textures to awaken our senses. I appreciate the economy, of using what we have, finding creative ways to incorporate color, texture and scent and finding new combinations. Flower arranging forces me to look at the garden with new eyes. Just a few snips is all it takes to fill a vase. If you see me out in the garden with a pair of sheers, stop and say hello. I'll probably fill a jar with flowers, herbs and greens for you.